Nokomis' Andrew Haining thrilled for Tyler Pelletier's performance. 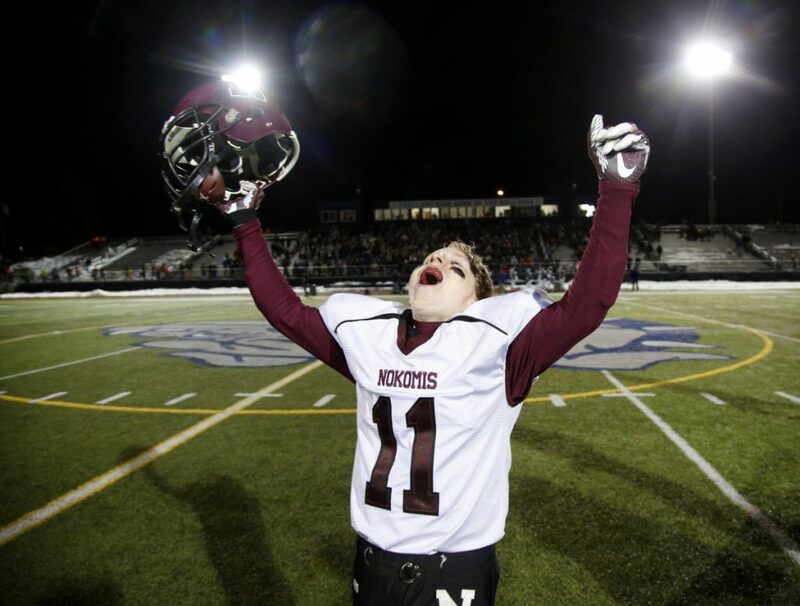 Tyler Pelletier wasn’t the only one happy to see his fourth-quarter punt return go the distance for what became the winning touchdown in Nokomis’s 13-12 victory over Fryeburg in the Class C championship game. His teammates were thrilled to see it as well — one in particular. The two teamed up on Nokomis’s first score, with Haining tossing a screen to Pelletier for a 13-yard touchdown connection. Thornton Academy’s first touchdown play of the game, a 61-yard pass to Anthony Bracamonte from Kobe Gaudette, came with 10:22 left in the first quarter and set the tone for the Class A championship game. On its own 39 and facing a long third down, Gaudette dropped back and saw Bracamonte with a step on his defender near the left sideline. With the ball in the air, it looked as if Gaudette may have overthrown the speedy receiver. Instead, Bracamonte caught it in stride with outstretched arms at the Portland 30, before putting a spin move on a Bulldog defender to run untouched to the end zone. “I hit my third gear to get that (pass). I thought I was going to have to dive,” Bracamonte said. The spin move Bracamonte used to avoid a tackle drew oohs and aaahs from the crowd, it was nothing new to his teammates. “That’s expected. He’s a great athlete,” Gaudette said. Beating Thornton Academy was going to be hard enough for the Portland football team. The Bulldogs’ special teams didn’t make that task any easier. Looking to upset the powerful Golden Trojans in the Class A championship game, Portland was plagued early by mistakes that nixed its chances of grabbing some early momentum and crippled its chances at pulling off a stunner in what became a 49-14 Thornton win. The special teams gaffes popped up quickly. After Thornton scored on its first possession, the ensuing kickoff was a low liner to Ben Stasium, who was standing near the goal line. Unsure how to field the falling kick, Stasium let the ball bounce, then picked it up and went to a knee just in front of the end zone. The refs ruled the ball downed at the 1-yard line. Portland went three-and-out, and disaster struck again on the ensuing punt. Anthony Bracamonte, one of the more explosive talents in the state, took the kick, ran around the right side and was hardly touched on his way to a 34-yard touchdown. The score was 14-0 less than three minutes in, and the Golden Trojans were on their way. But Hartman said his team tried to stay positive despite the ominous start.